​Understanding and being able to manipulate code is one of the most important parts of Web Design. You are creating a web site using Photoshop & a Dreamweaver template. You will be creating a portfolio of work you have done throughout the semester. The portfolio website will consist of visual layout design, text, graphics, and media while editing HTML and CSS. You can include additional projects from the year or extra credit projects beyond those listed above, but if you do then you must select a number of projects that total in multiples of 4. Follow the tutorial EXACTLY to create your project. You must pay attention to the details! When you have finished your project, you will compress and save your Dreamweaver folder as a Zip Dreamweaver folder. Rename the .ZIP Dreamweaver folder as last name + first initial + Dreamweaver.zip. Submit the zipped file using the form below. If the file is too large then I will pull it from your computer. 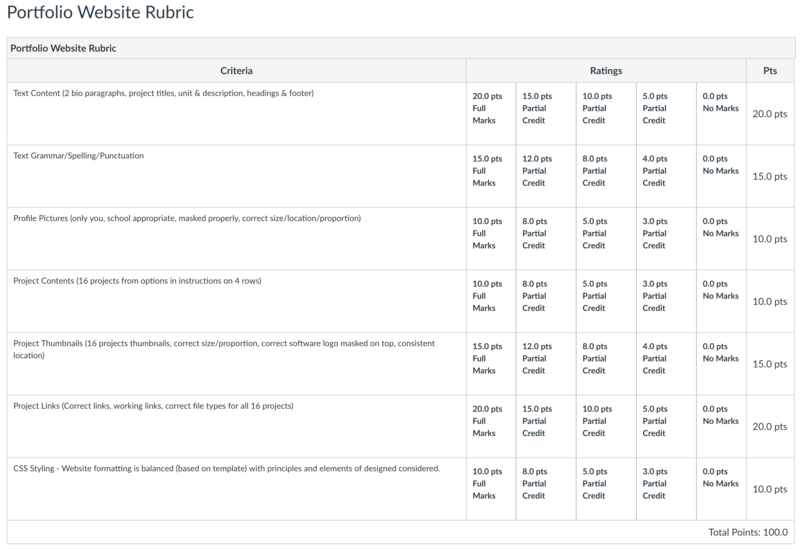 Don't forget to review the rubric to make sure you are meeting all of the project requirements!